The Great Pool is open for fishing all year round. Disabled Access Some fishing platforms are designed for disabled persons. For details of access through the barrier to the Great Pool contact the Park Warden. 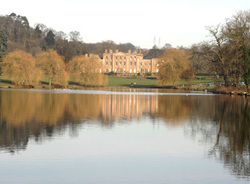 The Night Syndicate Himley Park operates a night time fishing syndicate. Membership is restricted to people who are over the age of 18 and who live locally. At the present time there is a 3-4 year waiting list for membership. Fishing is from a series of numbered pegs at a cost of £255.00 for the year. To become a member please contact the Park Warden for an application form. Himley Hall and Park is situated 4 miles from Dudley on the B4176 and approximately 6 miles from Wolverhampton just off the A449. The 256 Stourbridge-Wolverhampton bus service runs every 30 minutes along the A449. Himley Park gates are a 200m walk from the nearest bus stop (A449) and the Hall itself is a 1km walk via the park.